As lifelong residents of Oregon’s Hood River Valley, we’ve grown up with plenty of cherries and fresh, healthy produce. 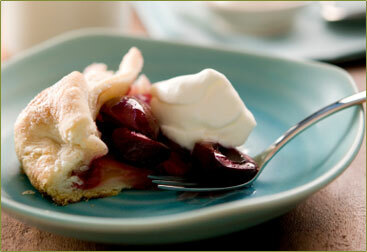 We never get tired of our cherries and we have favorite family recipes we’d love to share with you. Our customers share their recipes with us, as well. How do you like to use our cherries? We’d love to hear from you. Preheat the oven to 375ºF and arrange a rack in the center of the oven. Butter and flour a 9-inch tube pan. Let the cake cool completely then slice and serve with fresh HRCC cherries! Find the full blog post at Apt. 2B Baking Co. here. Find the full blog post at Gimme Some Oven here. Make the frangipane by beating the butter and sugar in the bowl of a stand mixer fitted with the paddle attachment until fluffy – about 1 minute on high speed. Add the eggs one by one, stopping the mixer and scraping down the sides of the bowl after adding each. Remove the bowl from the mixer and stir in the almond flour, then the rum or vanilla extract, almond extract, and salt. Spread the frangipane in the cooled tart dough. Slice the cherries in half. Press the slices into the frangipane in concentric circles. Bake for 30-35 minutes, or until the tart is golden brown across the top. Let cool, then brush lightly with cherry jam, if desired. If it’s not liquid enough to brush on, warm the jam gently in a small saucepan. Serving: Serve warm or at room temperature by itself, with whipped cream, or a favorite ice cream. Storage: Once baked, the tart will keep for 2-3 days at room temperature. Combine all ingredients and let chill for 24 hours. Serve over ice. In the bowl of a food processor, mix together the flour, sugar and salt. Pulse to combine. Add butter; pulse until mixture resembles coarse meal, leave a few pieces of butter remaining. Sprinkle with ¼ cup ice water. Pulse until dough is crumbly but holds together when squeezed with fingers. Try not to over process. Remove the dough from the food processor and roll it into two balls. Flatten into a disk and place both in plastic bag in the fridge to chill. After chilling, preheat oven to 400 degrees. On a floured piece of parchment paper, roll one disk of dough to a 14-inch round. Wrap dough around pin; unroll over a 9-inch pie plate. Press down on dough in bottom of pie plate. Next roll out the other disk and set aside to cover pie with. For pie filling: Combine all ingredients in a small pot. Bring to a boil and then lower heat. Stir frequently for about ten minutes until the mixture appears jelly-like. Remove from heat and allow cooling. Pour pie filling into pie dish and cover the top with extra rolled out dough. Press the crust to seal. Using a pastry brush, lightly brush top of dough with egg wash. In large saucepan, stir together water and cornstarch. Add cherries, sugar, lemon peel, and salt. Bring to a boil over medium heat. Cook 5 minutes, stirring until mixture thickens and becomes clear. Transfer fruit mixture to shallow 1-1/2 quart baking dish, set aside. To make biscuits; combine flour, sugar, baking powder, and salt in medium bowl. In a separate bowl, beat heavy cream until soft peaks form. Add cream to dry ingredients, mix with fork until mixture begins to hold together. Transfer to lightly floured surface; knead 10 times or until smooth dough forms. Roll or pat out to 3/4-inch thick circle. Place on top of fruit mixture. If preferred, topping can be cut with a biscuit cutter into 6 biscuits. Brush topping with milk or cream and sprinkle with sugar. Bake at 425°F for 15 to 20 minutes or until biscuits are browned and fruit is bubbling. Cool slightly before serving. In a large bowl, combine HRCC cherries, mixed greens, blue cheese and toasted hazelnuts. Drizzle salad with vinaigrette and toss.